Young Korean girl, Mija (An Seo Hyun), risks everything to prevent Lucy Mirando (Tilda Swinton)'s powerful multi-national company, The Mirando Corporation, from kidnapping her best friend - a super pig named Okja. 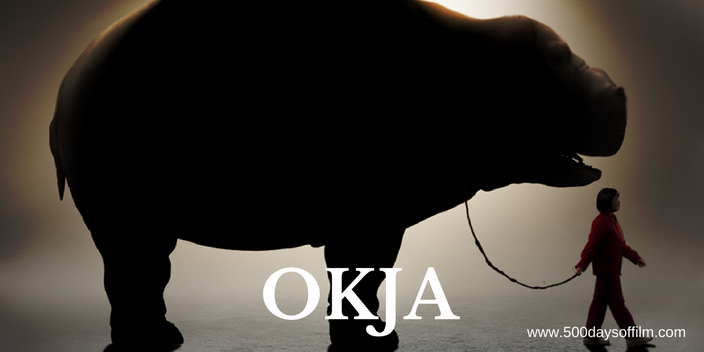 Okja has been bred to revolutionise the livestock industry. This enormous new breed of pigs leave a minimal footprint on the environment, consume less feed and produce less excretions. Could these new super pigs be the answer to the world's food shortage? Or is there something more sinister afoot? Okja is a joy - a real gem of a movie. Beautifully shot by Darius Khondji, this film is poignant and eccentric, heartwarming and horrific. Director, Bong Joon Ho starts by introducing his giant super pig. Terrifyingly, on paper at least, it is hard to argue with this concept. The world does not have enough food and needs an environmentally friendly solution. However, cold hard reality is a very different matter. Seconds in the company of Mija and Okja, playing in the mountains of Korea, and we are besotted by this innocent and determined girl and her utterly lovable super pig. We love them as we love Totoro and Mei, ET and Elliot. And this is the point - the uncomfortable conflict at the centre of Okja. We need food and consume it without thought about its creation or derivation. We live in active denial of the livestock process and we don’t want to face the horrific truth of what goes on behind the scenes. Okja's impressive cast all give powerful performances. Tilda Swinton is as fantastic as ever - playing both Lucy and her less palatable twin sister, Nancy, with toothy relish. Paul Dano is brilliant as Animal Liberation Front leader, Jay. Meanwhile, Jake Gyllenhaal has fun playing Mirando Corp’s repulsive celebrity front-man, Johnny Wilcox. However, Okja is An Seo Hyun’s film. She gives a superb performance - portraying Mija’s innocence and vulnerability and also her feisty determination to save her friend. When the film moves into its disturbing final act (earning its 15 certificate rating) she conveys the true horror facing Okja. Underneath its thought-provoking themes, Okja is also the answer to the frustrating question of why cinema rarely makes anything truly original anymore. The answer - given the opportunity it will. Cannes controversy aside, Netflix is giving directors like Bong Joon Ho (who, alongside Jon Ronson, also wrote Okja’s script) the freedom to explore unique and insightful stories and the room to create strange and wonderful movies. For Okja is undeniably strange - but it is also magical, entertaining and deeply poignant. For a fun Mirando Corp website just click here. Okja is one of many Netflix Original films. Click here for more. If you have, what did you think of Bong Joon Ho’s new movie? Let me know by leaving me a comment in the section below. Alternatively, do get in touch over on Twitter or Facebook!